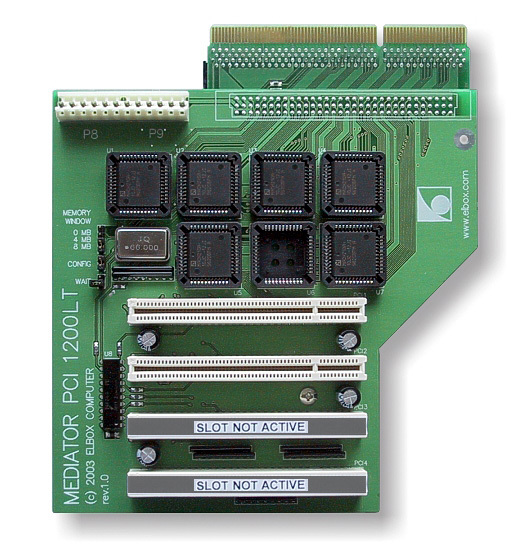 The Mediator 1200 PCI LT is a busboard designed to give towered A1200s active PCI slots. It is known to be compatible with the Blizzard PPC/060, Blizzard PPC/040, Blizzard 1260, Apollo 1260, Blizzard 1240, Apollo 1240, Blizzard 1230 (III, IV), Apollo 1230, GVP 1230, Elbox 1230 and M-Tec 1230. Parts of this page are © Elbox and are used with permission for inclusion in "The Big Book of Amiga Hardware"